» What is the Best Surveillance Hard Drive? Choosing the best surveillance hard drive is now much easier than it was years ago, primarily because all major drive manufacturers now design and market products geared toward specific segments of end use, including drives made specifically for recording video surveillance. There are some important reasons why you should choose these specific surveillance drives over the more common desktop hard drives, so keep reading to find out why. Who makes hard drives these days? There are really only three hard disk drive manufacturers left these days. Western Digital has the majority of the market share but only by a slight margin over Seagate, followed by Toshiba coming in a distant third place. These three companies have all grown over the years by acquiring the rest of the drive manufacturers that no longer exist. All three of these companies have segmented their product lines into different groups designed for different uses. These different groups can be roughly described as Desktop, NAS (Network Attached Storage), Surveillance Video, and finally Enterprise class storage. How are hard drives optimized for specific uses? There has been an industry trend to design drives for their end use for some time, and this seems to have really taken off with the wide availability of Solid State Drives, which have now become the default choice when speed and performance is the most important priority. This is typically the primary drive of a workstation which needs to be fast because a user is interacting with it in real time. Desktop Drives - While the SSD mentioned above is the choice for top performance, hard drives are still used here too, especially when low cost or high capacity is a priority. These drives are only designed for the low duty cycle required in a typical desktop PC, and are not designed to handle the rigors of extended continuous activity. They're also designed for use in enclosures with no more than a couple of drives present, and not in large arrays. Their firmware also prioritizes data reliability, so you can be sure you are reading and writing with no errors at all. As we'll see in a minute, that error checking is great for users, but not for security cameras. NAS (Network Attached Storage) - These drives are designed to run 24/7 with the varying loads of reading and writing typical of a NAS in a home or small office setting. They may also have Rotational Vibration sensors and are designed to handle running inside enclosures of up to 8 drives. Surveillance Video - While designed for 24/7 operation in groups of up to 8 drives like the NAS drives, these are optimized for the specific duty cycle required with surveillance cameras. Their main job is writing video from up to 64 cameras at once for 24 hours a day non-stop. There might be reading done from 5 to 10% of the time when viewing recorded footage, but there is always recording going on, and 90 to 95% of the time that's all the drive does. Its main job is to constantly record video from multiple cameras at the same time without ever stopping. The error correction on these drives is also designed to prioritize keeping up with the video streams first, which is completely different than a desktop drive. With surveillance recording it's better to keep up with all cameras at the expense of one corrupt or dropped frame which isn't a real issue at all. If you were using a desktop drive in this situation the drive would stop all recording while trying to recover that one error, causing you to lose video from all cameras trying to record to that drive during that time period. Enterprise Storage - Probably beyond the needs of most people reading this, but Enterprise drives are designed to be ran 24/7 in large arrays to meet the needs of larger businesses. These drives typically have higher performance, a longer warranty, and as you might expect, a higher cost. Hopefully it's obvious now that the best drive choice for recording video surveillance from security cameras is one specifically designed for that task by the manufacturer. While NAS and Enterprise drives can certainly be used for storing video from your cameras, a true surveillance drive is always the best choice when that's all the drive will be doing. A desktop drive is never the best choice for a system dedicated to recording camera footage, but many people still do it on occasion, and I've even done it when starting out as I'll explain below. If you compare the specifications of the surveillance drives offered by all three manufacturers you'll find that they are all very similar from one company to the next. Nearly the same warranty, throughput, and many other specs are found between similar drives no matter who makes them. You might analyze those specs in detail and choose one that you believe is technically better, but I doubt you will notice any difference in the real world. They're all going to handle your recording needs, and they're all very good because the technology is so mature at this point. What about failure rates? It's easy to search online and find people describing the problems they're had with one brand or another. All mechanical devices eventually fail when used, and hard drives are no exception. Here's another area where you could gather detailed information and try to make the best decision, and there's certainly nothing wrong with that. The reality is that all hard drive manufacturers have products that fail. I was a PC technician for over 10 years and have seen every brand fail, sometimes at high enough rates that there was obviously something terribly wrong with certain products. It seems to happen in cycles where Brand A starts failing at a higher rate than normal so many people switch to Brand B. After a period of time Brand A may have corrected its issues and Brand B starts having a higher than normal failure rate. Of course then people start switching to Brand C or back to Brand A. While all drives fail, thankfully hard drive technology is now very much perfected and we don't really see massive waves of failures like I described with Brands A, B, and C above. All three manufacturers produce very good products in my opinion. If you're in the USA like me, your choice will likely be between Western Digital and Seagate since Toshiba drives don't seem to be quite as easy to find here. I've had several computers around the house since 2005 and many of them run 24/7, so I still see the occasional hard drive failure even though I don't professionally support them anymore. I started with Maxtor desktop drives back then and kept using them until they started failing on me sooner than I thought they should, so I started buying Western Digital desktop drives instead. They worked fine but then I started buying Seagate desktop drives at some point because they seemed to offer better specs at a lower price. I've even tried some Fujitsu and Hitachi drives over the past 10 years with mixed results, and with every brand I usually just grow out of a drive before they fail which leaves me with all of these old but still working hard drives like the ones shown to the right. I had two different DVR units recording my analog cameras back in the day, both using Western Digital desktop drives for years without failure. I certainly don't recommend using desktop drives but that's what I had on hand and they did work fine for me there. Admittedly though, a DVR with four standard definition analog cameras is not near as demanding as a newer system with more megapixel IP cameras. When I switched to IP cameras I used several 3TB Seagate desktop drives simply because I had them available here to use. I did eventually have one of them begin to fail in exactly the way that I described error correction earlier. It would occasionally get an error and keep retrying over and over to complete the task, causing lost frames on all cameras until the drive gave up and moved on to continue recording again. One last time, desktop drives are not designed for the 24/7 constant uninterrupted writing we need, and their error recovery algorithms can really cause problems for surveillance. I still use Seagate drives to this day and eventually phased out the desktop drives in my video recording server, replacing them with Seagate drives designed for surveillance use. I have not had any Seagate failures to date other than the one desktop drive that failed after constantly recording video with it for several years. These manufacturers are constantly evolving and improving their offerings trying to improve and gain market share. 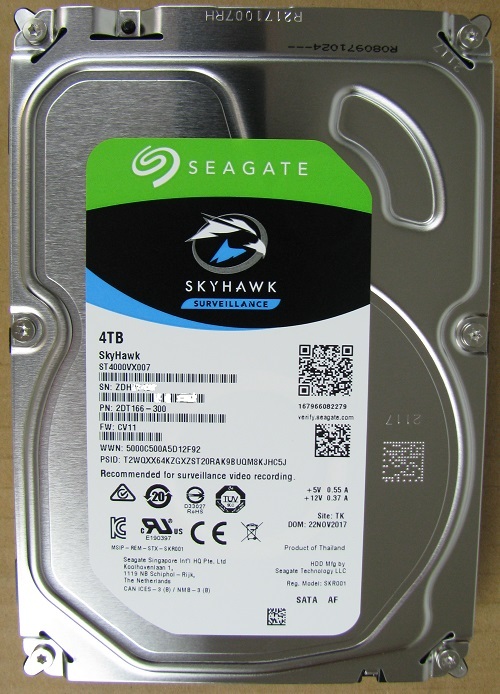 The original Seagate SV35 series became Seagate Surveillance, which then became Seagate SkyHawk Surveillance today. The Western Digital Purple WDPURX became WDPURZ, and Toshiba recently released their new S300 series. You'll find some people who say Brand A is great and Brand B is not, and just as easily find other people who say the exact opposite. I think cars are a good analogy to hard drives here, they're all mechanical devices that eventually fail with use over time, and everyone has their own preferences based on their own research and experiences. Hard drive technology is now very mature and there is no great difference between brands. I happened to choose Seagate for my surveillance needs but probably would have been just as happy with Western Digital if I had started using them first instead. 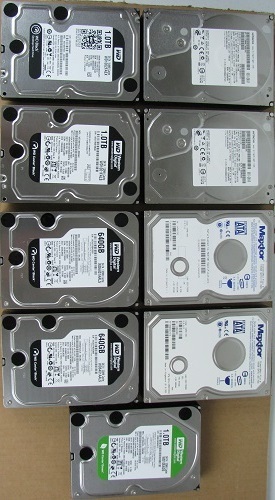 Seagate, Western Digital, or Toshiba. They all make drives that are optimized for recording your video surveillance and currently available in capacities up to 10 TB. Whether you just need one drive for a DVR or NVR, or multiple drives for a larger VMS solution, check out the links below for the best price at Amazon.